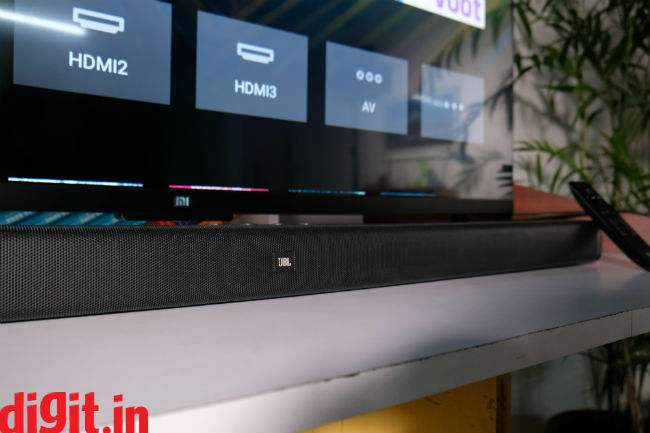 For about Rs 24000 you get a well built soundbar with a wireless subwoofer that's easy to set up and has good connectivity options. It will definitely enhance your TV viewing experience. However, its music performance may not appeal to audiophiles and the low channel separation can take away from the movie watching experience. A worthy contender at its price point. TVs are getting slimmer by the day and the biggest compromise is on sound quality coming from the TVs built-in speaker. With the slim profile of most TVs today the best you get are 2 10W down firing speakers. Its safe to say that apart from watching news and some generic TV, most TVs today (especially budget TVs) don’t offer the audio experience you deserve when watching a blockbuster movie on your brand new flat screen. If you are one looking for a good sound experience and don't want to invest in a home theatre, then you can choose a soundbar. It's simple to install, consumes little space and if you find the right one, it will enhance your movie watching and gaming experience. 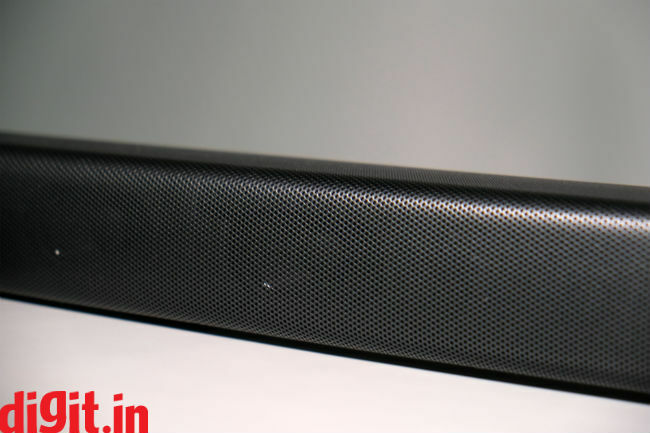 Today we have with us the JBL Bar 2.1 soundbar. It is priced at Rs 23,500, cones with a wireless subwoofer and a wide range of connectivity options. Is it the perfect companion to your TV? Kicking things off with the build and design of the soundbar, it’s well built. It has a metallic grill covering the front protecting the drivers. At the bottom it has two rubber feet which give it good grip when kept on a table. The front also houses the display (LED callout) neatly hidden behind the metal grill. You can see the display, it is easy to read and gives basic information like the input source, volume level, pairing, etc. At the top you have rubber buttons which are on/off, volume controls and source. The buttons are big enough so you don’t accidently press the wrong one, clicky and well built. The bar does feel premium overall. The sound bar is 2.3-inches tall which means that it should fit comfortably under most TVs which are standing on a table top. The bar is black in colour, looks minimalistic and isn’t distracting when placed below the TV. 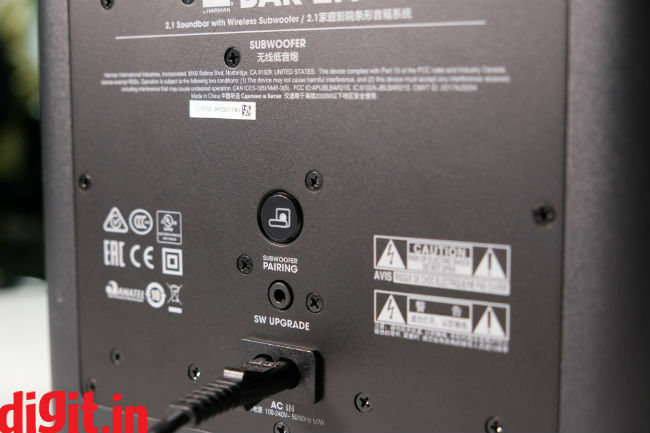 Coming to the subwoofer, it is wireless which means that there is no physical connection between the soundbar and the subwoofer. It connects wirelessly when both the soundbar and the subwoofer are plugged in and powered on. There is a white light behind the subwoofer which blinks when it is finding the connection and is solid white when the connection is established. The subwoofer is down firing and has a 6.5-inch bass driver. 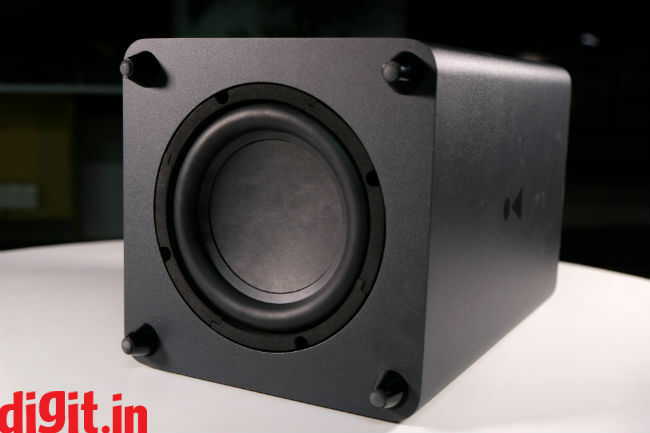 The subwoofer has 4 rubber feet holding it sturdy in one place. Overall the build of the soundbar and the subwoofer is very good. Its minimalistic without any jazzy design which ensures it blends well with almost all TV setups. 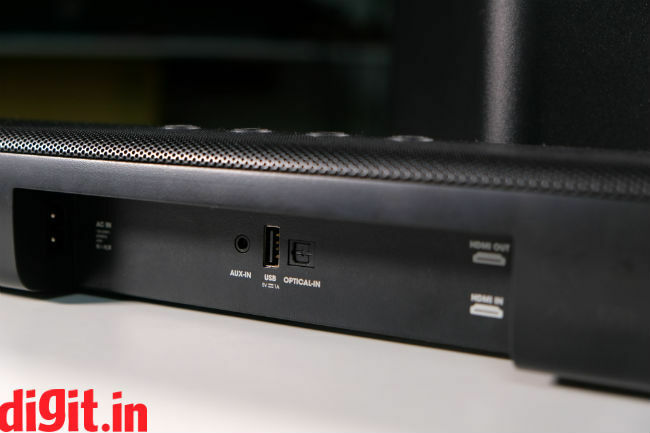 When it comes to connectivity, the soundbar has an AUX input, USB, bluetooth, HDMI in for passthrough) and an HDMI out for ARC (Audio Return Channel). Setting up the soundbar and subwoofer is very easy. Simply connect the two to a wall outlet, switch it on and you are good to go. The subwoofer and soundbar sync in a matter of seconds. You can easily navigate the source and sound options from the remote control. The system comes with an 3.5mm AUX cable and a optical cable in the box which is nice. But since HDMI ARC is there I wish it came with an HDMI cable in the box as well. 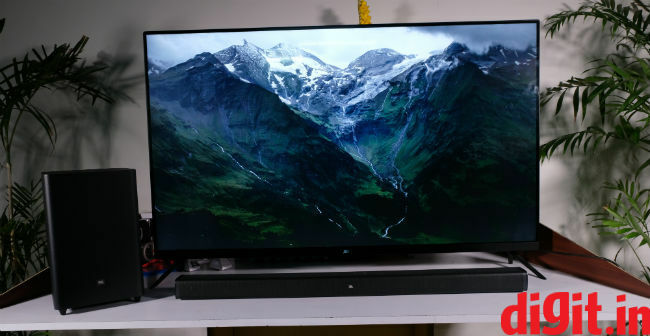 Another thing to conder is the fact that 4K TVs have become cheap today and to fully exploit the HDMI pass through it would have been nice if the sound bar offered 4K pass through. Future proofing the device, I wish it had built in chromecast. This would be a great feature if you have an entry level TV which isn’t really smart. Some of these features are available on soundbars commanding a higher price tag, but I think it's time they made an appearance on budget soundbars. Coming to the remote control, it is made of plastic and doesn't have the same premium feel found on the soundbar. It is lightweight and buttons are rubber with a clicky feel to them. The power and source buttons are easy to distinguish without having to look at the remote. 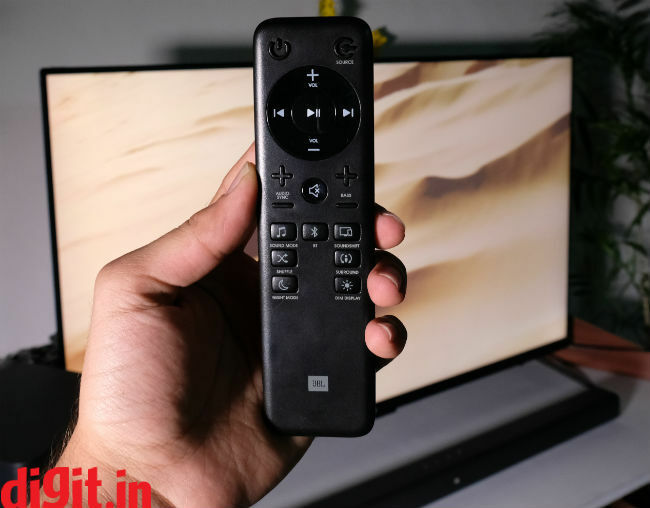 The remote gives you access to a bunch of features such as audio sync, bass, sound mode, sound shift, surround, night mode and more. There is also a Dim Display button which dims the display on the soundbar for a more immersive viewing experience. Overall the remote control is functional, easy to use with one hand and has a convenient layout. To test the performance of the JBl Bar 2.1, I have broken it up into music, movies and gaming. Wherever possible I have tried to listen to the same audio through different connectivity options of the speaker to give you a perspective as to which is the best source to use. I primarily played music from Apple Music and YouTube on a smartphone and connected it to the speaker via bluetooth. I played some Poets of the Fall, Charlie Puth, Pink Floyd, Wake Me Up by Avicii, Maria Tambien by khruangbin, Petercats recording company, portrait of a time and more. One thing to note is that the JBL Bar 2.1 delivered good bass when listening to music. But when it comes to clarity of the instruments, vocals and overall sound, my Mackie CR5bt are better. But thanks to the dedicated sub, bass heads can enjoy the JBL. if music is your prime reason, then you are better off looking at other speakers. I connected the soundbar to a TV via HDMI ARC and saw a bunch of movies/TV shows from Netflix, Hotstar, Prime Videos, and good old fashioned USB drive connected to the TV. I saw some of the same content by connecting a 3.5mm cable to the headphones out of the TV and AUX port of the speaker. One thing is clear, if the source of your content doesn't have good audio, it will reflect on the speaker. Also, between AUX, bluetooth and ARC, I recommend using ARC as it delivered the best of all the content from the TV. Watching movies from Netflix and the USB drive, the audio seemed crisper when compared to the 3.5mm alternative. From the bass driving thumps of guns mixed with club music in the red circle fight scene in John Wick to the staircase fight sequence in Daredevil season 2, the sound captured all the details. However, there is one thing to note. The channel separation in the speaker is very weak. If there are 2 people talking on the screen standing at opposite ends, the sound still comes from the centre. If there is a vehicle passing from the left to the right (Mission Impossible: Rogue Nation Bike chase Scene) there is no channel separation. It feels like all the sound is coming from the center. There is a surround button on the remote control, but that just seems to make everything louder rather than giving a surround effect. When it comes to gaming, I played some games on the Xbox One X and the PS4 Pro and the experience was a lot of fun especially if you enjoy playing shooter games. Manually up the bass if you like to feel the extra thump of a shotgun. However, once again I am plagued with the problem of channel separation. In a game like Uncharted: The Lost Legacy, and Rise of the Tomb Raider, the quieter sequences when you need to know where the enemies are on screen, its a little tough to discern. It's easier once you rotate the camera to get a distinct left or right positioning, but that isn't the best experience. Overall, the gaming performance is good with dialogue nats and gunfire, but i wish the chanel separation were better. 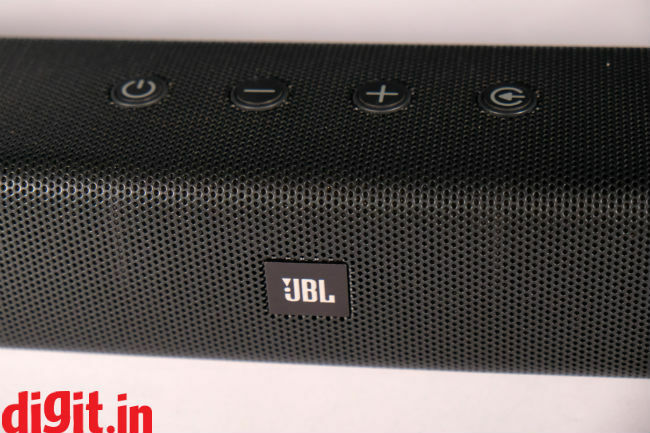 For a price of about Rs 24,000 does it makes to pick up the JBL Bar 2.1? It is a well built soundbar, the wireless subwoofer means it can be easily set up away from the soundbar. It is literally plug and play, looks good and has decent connectivity options. The audio performance is definitely an upgrade from the regular TV speakers and movies and games are well enjoyable. Music lovers can get finicky, but for the average joe at home, it shouldn't be a deal breaker. What is a deal breaker is the lack of channel separation and this can reduce the immersion in a movie when everything is being thrown at you from the centre. For the same price you can get soundbars from Sony, Samsung and more. You can also get Sony’s 5.1 Soundbar home theatre, but that’s a system I still need to test and it will require some setting up with the rear speakers. You also get JBL’s Cinema SB450 which allows for 4K HDR passthrough (yet another system I need to test) for Rs 29,000 approx. The point is, you have a lot of options to choose from at this price point and the JBL Bar 2.1 is definitely one worth considering. Also, as I mentioned above, we wish the soundbar has 4K passthrough and offered built-in Chromecast capabilities which would make it a great value proposition for those looking to make their budget TV smarter.